Columbia Paint Provides Paint for Adventure Web Office! Columbia Paint Provides Paint for Adventure Web Interactive! The entrance to the Adventure Web Interactive office after being renovated with fresh paint. 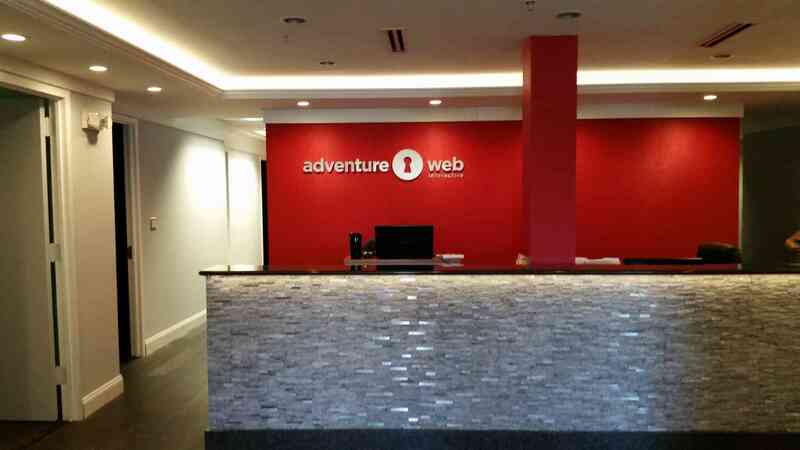 Columbia Paint recently provided the paint for the brand new offices of Adventure Web Interactive, a website marketing company. This is a great opportunity to see how Columbia Paint’s supplies work in action. Adventure Web Interactive let their employees play an active role in the decision-making process for the interior paint colors. The result is a space that looks professional and that all employees enjoy working in. The bloggers at Adventure Web Interactive are happy with their chosen paint color! Part of Adventure Web Interactive’s services include providing blogs for clients’ websites and managing clients’ social media accounts. The room where this all happens is The Social Media Lounge. The copywriters of Adventure Web Interactive chose the cool “Ice Blue” paint to represent the preferred color of many popular social media websites, like Facebook and Twitter, as well as to create a soothing and meditative work environment that is conducive to productivity. After having a “painting party”, the finished room is one that the employees are proud to work in and that also presents a welcoming, professional appearance to clients who drop in to visit their bloggers. Every employee knows the importance of being heard. By allowing employees to have a stake in the color of their office, the employees felt appreciated and in the loop with the important decision-making process. The company colors of Adventure Web Interactive are bright red and pitch black, which are great colors for a logo but a little overpowering when used as room colors. 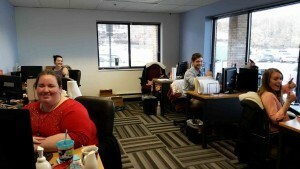 Instead of painting every office with their signature colors, Adventure Web Interactive allowed employees to choose the paint colors that worked best for them, so that now, rather than working in a stressful bright red room, the copywriters of Adventure Web Interactive are working in a peaceful ice blue room. Employee contribution has valuable and tangible effects!